Here we are on Fesdu Island, Maldives in March 1997. The hotel thought it was our anniversary and decorated our table in the dining room with bougainvillea! more info about our holidays. John's email address is: . Do drop me a line if you want to know more about our holiday resort reports, or if you have any comments about the web site, and how it may be improved. John's daytime phone number is ... available on application by email. We live in a village in Bedfordshire, England (email us if you want the full address). We love our holidays - seeing exotic places, lying on the beach, eating in Greek tavernas, snorkelling on coral reefs, walking in the mountains. Click here for our Holidays page - resort reviews, accommodation tips etc. John learned to dive in the Maldives, where the water is like a warm bath (29°C all year round). The coral reefs are spectacular, and the marine life is just out of this world! 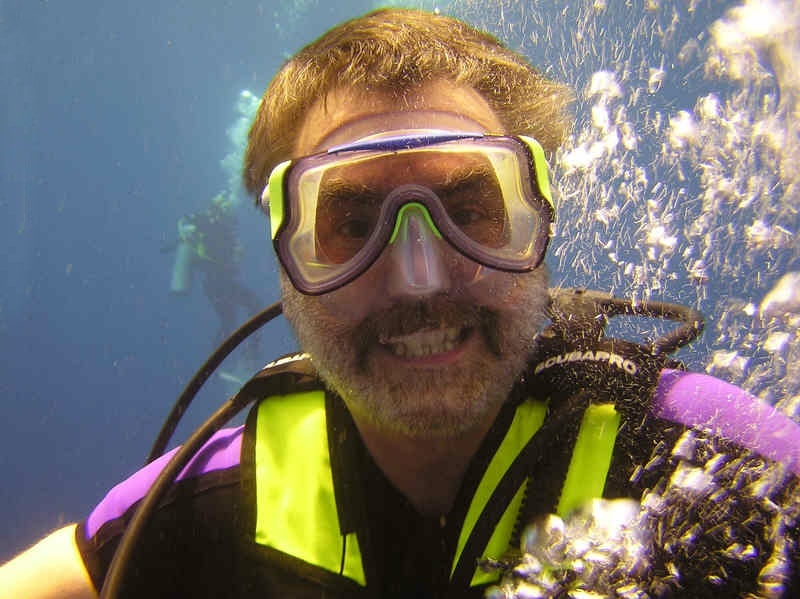 John has swum with manta, eagle and sting rays, leopard, nurse and whale sharks, caribbean, white-tip, black-tip and grey reef sharks, turtles,	barracuda, and hundreds of species of reef fish. Read John's reports of diving in the Caribbean, the Maldives, and Thailand. Currently using Canon Digital Ixus 110 and Olympus 750 Ultrazoom digitals, with underwater housings, and a Canon EOS 550D with a Canon 18-200mm zoom lens. Check out our holiday reports for underwater pictures in the Maldives and the Caribbean. In 2002 we got interested in our ancestors, using the (now closed) Family Records Centre in London and Web resources such as Ancestry, Old Maps, FamilySearch, FindMyPast and FreeBMD to research our ancestors. See how far we've got - John's Ancestors. From 1973 to 1998 he worked for NatWest. In Feb 1998 he had the opportunity to grab a package and leave. NatWest couldn't manage without him though - it was subsequently taken over by Royal Bank of Scotland and driven into the ground by Fred Goodwin's megalomaniac ambitions. From 1998 to 2001, he was a project manager with The Admiral Group (no, not the car insurance people, a project-led consultancy group) with responsibilities including project-managing the development of training, and managing the production of bids in the Defence and Government sector. In June 2000 Admiral was taken over by Holland-based CMG, and the new group was called CMGAdmiral. In October 2001, as the hi-tech bubble burst, CMGAdmiral announced that it was making 10% of its work-force redundant. Because he had been attached for a six-month stint to a section that was disappearing anyway, he found himself without a role, and hence without a job. A year or so later, the "Admiral" part of the name was dropped, and the group reverted to "CMG". ... and the CMG part of the name was dropped in 2008. Tee hee. And in August 2012, Logica were taken over by CGI Group Inc of Canada, and the Logica brand name disappeared shortly afterwards. Last time I looked, the logica.com web site took you straight to CGI's web site, where Logica only featured as a short paragraph in the "Our History" section. In January 2013, doubtless amid the sounds of whalesong and with the smell of incense, the corporate brand planners changed the logo, making it "...enlarged and simplified to demonstrate a direct, powerful presence for CGI in the market going forward". Back with NatWest, or rather The Royal Bank of Scotland, in 2001 on a contract with the very successful Streamline Merchant Services, part of the RBS Group. So the "dunbankin" domain name wasn't too relevant! I ended up project managing a superb (though I say it myself) £2m+ web project ("Streamline Online"), and I left Streamline after its successful launch in 2006. While I was there, Streamline acquired several other UK, European, US and global brands such as WorldPay, Bibit and Lynk, and combined them all under the umbrella title of "RBS WorldPay". In October 2015, Worldpay floated on the London Stock Exchange, and was valued at £4.8 billion. In August 2017 it was announced that Worldpay was "merging" with US rival Vantiv. Vantiv will have more directors on the board, a greater share of the share capital, and the group headquarters will be in Cincinnati, Ohio in the U.S. So it's a "merger", similar to how Poland "merged" with Germany in 1939. Vantiv paid US$10.4bn for WorldPay. Vantiv changed its name to Worldpay, Inc. on January 16, 2018. The chase goes on... On 18 March 2019, WorldPay Inc was bought by Florida-based Fidelity National Information Services (FIS) for US$35bn in cash and shares, plus WorldPay's debt. The combined company will retain the name FIS, there will be more FIS directors than ex-WorldPay directors on the board, the HQ will remain at FIS's HQ in Florida, and the Chairman and CEO of FIS will keep control. It was unclear if the WorldPay name would be retained as a trading name of FIS. Now relaxing after leaving Streamline in 2006 following the successful launch of his main project "Streamline Online". I had a link here to Streamline Online's website, but it no longer works because Worldpay have moved the website, and although it seems to be the same website, it has been given a complete make-over cosmetically to fit in with Worldpay's corporate style. Linda also grabbed a package from NatWest in 1999 and then worked for a firm of solicitors, who seemed to appreciate her securities perfection know-how. Now also relaxing. Check Paul Lewis' web site for an explanation. Blogging software wasn't available when I started this site, so it's custom-made, and I continue to tweak it to look better. Converted the entire site from HTML4 to XHTML1.1 following W3C's guidance, then back to HTML5/CSS3 when fashions changed. Bought our domain name "dunbankin" in 2001 from Just-the-Name - a brilliant service which worked really well, until it was bought by BT, who suddenly decided to close down the service in 2017. So I've had to move both domain names and web site away to Namecheap, who seem to provide a good service at a good price. Got a web site? Get it listed in Google.